The Chicago School is one of the better known American "schools" of economics. The term was first used in the 1950s to refers to economists teaching in the Economics Department at the University of Chicago, and closely related academic areas at the University such as the Graduate School of Business and the Law School. In its strictest sense, the "Chicago School" refers to the approach of the members of the Department of Economics at the University of Chicago over the past century. In a looser sense, the term "Chicago School" is associated with a particular brand of economics which adheres strictly to neoclassical economic theory in its economic analysis, "free market" libertarianism in much of its policy work—asserting the view that people are best left to themselves, free to choose how to conduct their own affairs—and a methodology which is relatively averse to too much mathematical formalism and willing to forgo careful general equilibrium reasoning in favor of more results-oriented partial equilibrium analysis. Economists of the Chicago school are known for applying economic analyses to a broad spectrum of issues, many of which have normally fallen within the purview of other disciplines as far ranging as history, law, politics, and sociology. More academics who have worked at the University of Chicago have been awarded the Bank of Sweden's prize in economics than those from any other university. One of them, Milton Friedman, whose Monetarism provided an alternative to the powerful Keynesian economics of the earlier twentieth century, was one of the Chicago School economists whose work reached far beyond the confines of academia, influencing the public policy of presidents in the United States, as well as reaching the general public both in the U.S. and around the world. The vision and practice of Chicago School economists has been to carry out empirical, real-world research, combining basic theory with data to address contemporary and historical problems. They have been willing to tackle unpopular, controversial topics, and to consider any new idea about what makes people act the way they do. Their placing of the highest value “on personal and economic freedoms” has guided their efforts to bring about a society of greater justice and prosperity for all. The "Chicago School" of economics began in the 1920s with the work of Frank H. Knight and Jacob Viner. In an age when empiricism ruled most of American economics, Knight and Viner set up the economics department at Chicago as a bastion of counter-institutionalism. The Chicago duo were primarily theoreticians, and, as a result, the department soon acquired something of a "siege" mentality. While irreducibly Neoclassical in a general sense, Knight's approach was the direct inheritance of his Cornell professor, Herbert J. Davenport and what was then called the "American Psychological School" which sought to ground the Marginalist high theory of Jevons, Wicksteed, and the Austrians in the relativist foundations of Thorstein Veblen's methodology. Viner's views were quite different from those of Knight, favoring the Marshallian "real cost" theory and generally not being in favor of free markets. It was Viner's criticism of Keynes that made him famous and laid the foundation for the Chicago school's resistance to Keynesian economics. Viner is known for his belief, contrary to the analyses of Keynes, that it is the long-term that really matters. Also at Chicago during this time were the "Mathematical Trio" of Oskar Lange, Henry Schultz, and Paul H. Douglas who were influenced by the theoretical approach of the Lausanne School, and Henry Calvert Simons whose views favored laissez-faire and laid the foundation for the development of Monetarism. This “Second” Chicago school blossomed into one of the most influential schools of thought after Milton Friedman joined the economics faculty in 1946 and then was joined by his long-time friend George J. Stigler in 1958. Friedman revolutionized macroeconomics, while Stigler helped to do the same in microeconomics. In microeconomics, led by George Stigler, the guiding maxim in the Chicago approach was to follow the Neoclassical paradigm whenever possible. When there was no obvious solution to a particular problem, the recommended course was to extend the Neoclassical paradigm by incorporating new concepts into it that would make the subject matter amenable to economic analysis. Examples of such extensions conceived by Chicago economists are search theory (George Stigler), human capital theory (Gary Becker and Theodore Schultz) and property rights/transaction cost theory (Ronald H. Coase). Chicago long stood as the only school in America not overrun by the Keynesian Revolution. In Friedman's Monetarism, it found a means, both theoretical and empirical, by which to resist the Keynesian view. Friedman challenged the dominance of Keynesian economics in the postwar period, and Stigler’s writings undermined many of the rationales for government regulation of business. Friedman always claimed that the main tenets of Monetarism could be found in the work of early Chicago School economists such as Henry Simons. Some clarifications are in order, however. Firstly, not all economists within the the Department of Economics at the University of Chicago shared the beliefs and tenets of the "Chicago school." Although the department has produced more Nobel Prize winners and John Bates Clark medalists in economics than any other university, fewer than half of the professors in the economics department were considered part of the school of thought. Secondly, Friedrich von Hayek, a Nobel prize winner who taught at Chicago—because that was the only place he could find employment at the time and, nota bene, his faculty position was unpaid—is usually categorized not as a member of the Chicago School, but rather in the Austrian School of economics that included Carl Menger, Ludwig von Mises, and Murray Rothbard. The Austrian School of Economics did, however, exert a significant influence on the Chicago School. Frank Knight (1885-1972) was an early member of the University of Chicago department. His most influential work was Risk, Uncertainty and Profit (1921) from which was coined the term Knightian uncertainty. Knight's perspective was iconoclastic, and markedly different from later Chicago school thinkers. He believed that while the free market was likely inefficient, government programs were even less efficient. He drew from other economic schools of thought such as Institutional economics to form his own nuanced perspective. Ronald Coase (b. 1910) graduated from the London School of Economics and immigrated to the United States, settling at the University of Chicago. He became the editor of the Journal of Law and Economics. His first major article, The Nature of the Firm (1937), argued that the reason for the existence of firms (corporations, partnerships, and so forth) is the existence of transaction costs. Rational individuals trade through bilateral contracts on open markets until the costs of transactions mean that using corporations to produce things is more cost-effective. His second major article, The Problem of Social Cost (1960), argued that if we lived in a world without transaction costs, people would bargain with one another to create the same allocation of resources, regardless of the way a court might rule in property disputes. He won the 1991 Nobel Prize "for his discovery and clarification of the significance of transaction costs and property rights for the institutional structure and functioning of the economy." George Stigler (1911-1991) was a student of Frank Knight and won the Bank of Sweden prize in Economics, commonly referred to as the Nobel Prize, in 1982. He is best known for developing the Economic Theory of Regulation, also known as capture, which says that interest groups and other political participants will use the regulatory and coercive powers of government to shape laws and regulations in a way that is beneficial to them. This theory is an important component of the Public Choice field of economics. He also carried out extensive research into the history of economic thought. In a 1962 article "Information in the Labor Market" in Journal of Political Economy, he developed the theory of "search unemployment" (also known as "frictional unemployment"). In The Intellectual and the Marketplace (Stigler 1962), he proposed "Stigler's Law of Demand and Supply Elasticities" that "all demand curves are inelastic, and all supply curves are inelastic, too." He referenced many studies that found most goods and services to be inelastic over the long run. From that and a proof by Alfred Marshall that "the third condition [for inelastic demand] is that only a small part of the expenses of production of the commodity should consist of the price," he also proposed that "since most or all specific costs of production are relatively small, and entrepreneurs do not bother with small costs, … they do not bother with costs at all. Hence they do not maximize profits." Milton Friedman (1912-2006) stands as one of the most influential economists of the late twentieth century. He was a student of Frank Knight and he won the Bank of Sweden Prize in Economics in 1976, among other things, for A Monetary History of the United States (1963). Friedman argued that the Great Depression had been caused by the Federal Reserve's policies through the 1920s, and worsened in the 1930s. There is likely to be a lag between the need for action and government recognition of the need; a further lag between recognition of the need for action and the taking of action; and a still further lag between the action and its effects (Friedman 1962). His laissez-faire philosophy extended beyond economics. Friedman was a fierce opponent of the military draft, and called for the decriminalisation of prostitution and drug use. He courted controversy, not least when he and other Chicago School economists advised Augusto Pinochet in Chile, after the overthrow, in 1973, of Salvador Allende, the democratically elected president. Friedman defended himself by pointing to the ultimate fall of General Pinochet—"Freer markets lead to free people," he said. The Chicago School of Economics is known as a highly influential school of thought and methodology favoring free-market economics. The school closely follows neoclassical price theory (as developed by Alfred Marshall) and libertarianism. It rejected Keynesianism in favor of Friedman's monetarism, and later (after 1980) in favor of rational expectations as developed by Robert Lucas. It rejects most government regulation of business in favor of laissez-faire, regarding the market economy as a necessary (albeit not sufficient) condition for a free society. In terms of methodology three major areas can be identified in the school’s arsenal. As the ideological stress on “positive economics” intensified with time, empirically based studies intensified using statistics, with less stress on theory and more on data. Thus, the school has always been noted for its very wide range of topics, from regulation to marriage, slavery, and demography, rather than for its in-depth-studies. The Chicago economists also developed and appropriated a common method of analysis, which became a near hallmark of the Chicago school. The stepping stone was rigorous mathematical modeling combined with statistical research to demonstrate the empirical validity or falsity of an economic theory or policy prescription. By way of this methodological structure, their students, and a growing number of followers in the profession, exposed as erroneous the Keynesian presumption that markets are inherently unstable and prone to monopoly. In short, the school has always relied to an extraordinary extent on mathematical models through which, as some of its critics charge, the scholar can prove anything he or she wants to. For example, such absurdities as criminal activity is a career choice, and that smoking is an example of making an informed choice (between cancer risk and immediate gratification) can be derived from this methodology. The third major methodological innovation that set the school apart from the other existing economics departments was that their scholars met together in frequent intense discussions that helped set a group outlook on economic issues, based on price theory. In the post-war period, the economics department at the University of Chicago consciously designed an institutional infrastructure to support the application of the analytical tools of price theory, monetary theory, and econometrics to the study of competitive markets. Drawing upon a particular conception of what social scientific work could be, the teaching and research missions of the department for both students and faculty were merged by the construction of the workshop model. The creation and evolution of the workshops, and their relationship to the curricular model of graduate education, in the department can be traced from their origins in the 1940s to the late 1970s. The workshop model was integral to the success of the Chicago School of Economics. Throughout the twentieth century the Chicago school’s rival in the defense of market order and free society has been the Austrian school, led by Ludwig von Mises and F. A. Hayek. Like the Chicago economists, the Austrians have forcefully demonstrated the superiority of the free market and the hazards from all forms of socialist planning and government intervention. They too have emphasized the uniqueness of the individual and the value of liberty. However, their starting points have been radically different in reaching their pro-market conclusions. In his famous essay on “The Methodology of Positive Economics” (1953), Friedman argued that the goal of science was successful quantitative prediction and that any hypothesis, no matter how unrealistic its assumptions, was good if it resulted in better predictions. Thus, as one critic pointed out, if a strong correlation was found between the anchovy catch off the coast of Peru and business cycle fluctuations in the United States, this would be considered a good predictive theory, regardless of any real causality between these two measured events. Austrians also believed that science should try to “predict,” if by prediction one means understanding the causal relationships between society and the market. But Austrians have always emphasized that the unique characteristic of social and market phenomena is humanity’s purposefulness (an approach that was strongly defended by one of the older Chicago economists, Frank Knight). Austrians always felt that to make sense of the market requires looking beneath statistical relationships. What is a consumer good or a capital good? When is a transaction “voluntary” and when is it “coerced”? What is a “competitive” market situation and when is a situation “monopolistic”? When is a “profit” earned and when is a “loss” suffered? What is it that entrepreneurs do and how do they and others in the market form expectations about the future? These concepts and relationships are dependent on how individuals assign meanings to their own actions and to the objects and actions of other human beings around them. They are not reducible to measurable categories to which statistical methods of correlation may be applied. For decades, Austrian School economists have warned against the dire consequences of having a central banking system based on fiat money, money that is not grounded on any commodity like gold and can easily be manipulated. In addition to its obvious disadvantages (price inflation, debasement of the currency, and so forth), easy credit and artificially low interest rates send wrong signals to investors and exacerbate business cycles. Not only is the central bank constantly creating money, but the fractional reserve system allows financial institutions to increase credit many times over. When money creation is sustained, a financial bubble begins to feed on itself, higher prices allowing the owners of inflated titles to spend and borrow more, leading to more credit creation and to even higher prices. As prices get distorted, mal-investments, or investments that should not have been made under normal market conditions, accumulate. Despite this, financial institutions have an incentive to join this frenzy of irresponsible lending, or else they will lose market shares to competitors. With "liquidities" in overabundance, more and more risky decisions are made to increase yields and leveraging reaches dangerous levels. During that mania phase, everybody seems to believe that the boom will go on. Only the Austrians warn that it cannot last forever, as Friedrich Hayek and Ludwig von Mises did before the 1929 crash, and as their followers have done in the early twenty-first century. The problem, as the behavioral economists of the 1970s (Amos Tversky, Frank Kahneman, and others) found out, is that the future is not as quantitatively predictable as too many Chicago economists have liked to believe. Indeed, one hypothesis for which Friedman was most famous in the 1960s and 1970s, that there is a relatively high correlation between some measurement of the money supply and national income, has become a hotly debated issue in macroeconomics ever since, as the definition of the money supply has become more uncertain and the correlations have become more unstable. Furthermore, by insisting on a primarily statistical analysis of macroeconomic events, the data available have tended to be highly aggregated, with the focus on such things as output and employment as a whole and the general price level. This means the supply and demand details and the interconnections between various prices, which represent the actual causal relationships in the economy, are lost beneath the macro-aggregate surface. Yet, these microeconomic relationships, and how changes in the money supply influence and potentially distort them, have been the very essence of the alternative Austrian approach to understanding inflationary processes that end in recessions and depressions. Thus, for example, when Friedman looked at Federal Reserve policy in the 1920s and saw that the general price level had remained relatively stable, he concluded that Fed policy had done nothing wrong. The only error by the Fed was in the early 1930s, when it did not print more money to counteract the price deflation that was occurring at that time. The Austrians, on the other hand, looking below the stable price level, concluded that Fed monetary policy had actually been highly “activist” and had generated imbalances between available savings and investment that finally resulted in the economic downturn of the 1930s. Whereas the Chicago economists of that time, and Friedman later, believed that the Fed should have “reflated” the price level through monetary expansion in these years, the Austrians reasoned that the distortions caused by the earlier inflation would only be made worse through any new round of inflation. Once the relative price and production relationships had been distorted by the earlier inflation, the only way to return to stability was through an adjustment of prices, wages, and production reflecting the new post-boom reality. Differences with the Austrians aside, the Chicago School closely followed neoclassical price theory (as developed by Alfred Marshall) and libertarianism. It rejected Keynesianism in favor of Friedman's monetarism. Those monetary beliefs underpinned the 30-plus books that appeared under Friedman’s name, most notably perhaps A Monetary History of the United States, 1867-1960, as well as a host of other writings including a regular column in Newsweek magazine. He urged deregulation and individual initiative as the keys to economic success—a view embraced by the U.S. presidents Nixon, Ford, and Reagan, and by Margaret Thatcher in Britain. Monetarism at Chicago School has, however, since given way to the more mathematically rigorous "New Classical" economics of Robert E. Lucas in the 1970s and 1980s. The quantitative emphasis started with the appointment of Lucas, who developed the theory of Rational expectations which rejects most government regulation of business in favor of laissez-faire. The Chicago School's impulse for the extension of Neoclassical price theory to various fields is largely responsible for the "imperialist" character for which it has often been accused. Thus, the school is known for applying economic analyses to problems normally restricted to other disciples. Business and finance were given economic treatment by Chicago economists, such as Harry Markowitz, another Nobel Prize winner who developed Modern portfolio theory, listing John von Neumann, Oskar Morgenstern, and Jacob Marschak’s arguments concerning expected utility and game theory, among his theoretical roots. 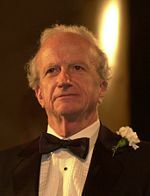 Gary Becker at the National Science Medal award ceremony, 2000. 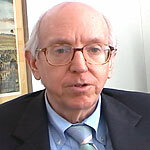 Political science and institutional theory were brought into Neoclassical economics by Chicago School economists such as George Stigler, Ronald Coase, and James M. Buchanan (a student of Frank H. Knight), economic history was given a Neoclassical reading by Robert W. Fogel, while the Chicago Law School (particularly Richard Posner) used economics to address legal theory. Even sociological issues like addiction, family, and marriage were given a thoroughly economic interpretation in the hands of Gary Becker, another Nobel Prize winner. Hence, to define the Chicago economists' work that has benefited the world, we can say that: The Chicago school economists have been doing empirical, real-world research, combining basic theory with data to address contemporary and historical problems. They have been willing to tackle unpopular, controversial topics and to consider any new idea about what makes people act the way they do. They constantly redefine and expand boundaries to include finance theory, the economics of information, rational expectations, and law and economics. Chicago economics analyzes the responses of individuals, firms, and the public sector to costs, benefits, and incentives; pairs a fundamental appreciation for the power of competitive forces with a healthy distrust of governmental intervention in markets; and places a high value on personal and economic freedoms. True to this pledge, the Chicago School of Economics, led by Friedman in the 1980s and 1990s, helped to bring down, economically, virtually all the Communist regimes in Eastern Europe, in the COMECON countries (and eventually the USSR) by the clandestinely round-table discussions with the local “underground” economic elites and unofficial samizdat-style distribution of Friedman’s Newsweek articles and via the television series (that could be seen in Eastern Europe) on which the whole circle of his Chicago colleagues collaborated. The imperative of placing the highest value “on personal and economic freedoms,” is probably the ever-lasting legacy of the Chicago School of Economics. Coase, Ronald. 1937. The nature of the firm. Economica 4(16): 386-405. Coase, Ronald. 1960. "The problem of social cost." Journal of Law and Economics 3(1): 1-44. Retrieved October 17, 2008. Friedman, Milton. 1966. Essays in Positive Economics. Chicago, IL: University of Chicago Press. ISBN 978-0226264035. Friedman, Milton. 2002. Capitalism and Freedom. Chicago, IL: University of Chicago Press. ISBN 978-0226264219. Friedman, Milton, and Rose Friedman. 1990. Free to Choose: A Personal Statement. Harvest Books. ISBN 978-0156334600. Friedman, Milton, and Rose Friedman. 1998. Two Lucky People: Memoirs. Chicago, IL: University of Chicago Press. ISBN 0226264149. Hammond, J. Daniel, and Claire H. Hammond. 2006. Making Chicago Price Theory: Friedman-Stigler Correspondence, 1945-1957. London: Routledge. ISBN 0415700787. Jones, George. 2006. "Thatcher praises Friedman, her freedom fighter." Daily Telegraph. Retrieved October 15, 2008. Kasper, Sherryl. 2003. The Revival of Laissez-Faire in American Macroeconomic Theory: A Case Study of Its Pioneers. Edward Elgar Publishing. ISBN 1840646063. Miller, H. Laurence, Jr. 1962. On the 'Chicago School of Economics'. The Journal of Political Economy 70(1): 64–69. Nelson, Robert H. 2001. Economics As Religion: From Samuelson to Chicago and Beyond. University Park, PA: Pennsylvania State University Press. ISBN 0271020954. Simons, Henry C. 1948. Economic Policy for a Free Society. Chicago, IL: University of Chicago Press. ISBN 0226758915. Stigler, George J. 1962. The Intellectual and the Marketplace. Selected Papers, no. 3. University of Chicago Graduate School of Business. Stigler, George J. 1988. Chicago Studies in Political Economy. Chicago, IL: University of Chicago Press. ISBN 0226774376. Stigler, George J. 1988. Memoirs of an Unregulated Economist. New York: Basic Books. ISBN 0465044433. Wahid, Abu N. M. 2002. Frontiers of Economics: Nobel Laureates of the Twentieth Century. Westport, CT: Greenwood Press. ISBN 031332073X. All links retrieved February 10, 2017. History of "Chicago school (economics)"
This page was last modified on 10 February 2017, at 16:25.